The task of cleaning off graffiti is much easier if you have the best materials and tools for the job. Different types of paint require different solvents. The surface that the graffiti is applied to needs to be carefully considered in order not to permanently damage it. Surfaces could porous and absorb the paint, or delicate and easily stained. Expensive stone such as marble may require special coatings and there is an argument in protecting expensive materials to a certain height to ensure that any marks can be removed without hideously expensive specialist treatments. Painted walls require careful cleaning since the cleaner that removes the graffiti may also strip the paint. It is also impossible to use wire brushes or abrasive action on painted or polished walls, wooden panelling or fabric lined walls. Unfortunately, architects and builders need to carefully consider the choice of finishes that they apply to walls in public buildings. It would be wonderful to build a smart structure for public use and to select the most attractive finishes except that it is not practical because once graffiti artists get to work, the damage that they do could cost a fortune over a period of years. And so we all end up with utilitarian, easy to clean and difficult to stain tiled or similar surfaces. Graffiti is more difficult to remove once the paint has fully hardened or there are several layers of paint. 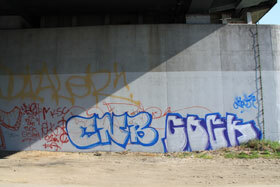 A graffiti policy ensures that everyone can react swiftly to remove the graffiti and eradicate the problem. Find more information about various products for graffiti removal in the 'Graffiti cleaning products shop'.